A federal judge dismissed a lawsuit Friday filed by a former city of Donna employee who claimed he was fired as revenge for speaking about a pay-to-play deal. Former public works Director Francisco de los Rios filed the lawsuit in 2016 after he was suspended and demoted for constructing a barbecue pit with city property, according to court records. U.S. District Judge Randy Crane threw out the lawsuit a day after granting a summary judgment requested by J. Arnold Aguilar, the attorney representing the city, former interim City Manager Ernesto Silva, former Assistant City Manager Josue Garcia, former council members Simon Sauceda, Sonia Gallegos and David Simmons as well as Councilwoman Cathy Alvarado. Gallegos learned about the lawsuit dismissal Friday, and said she was not concerned because she “knew he was making” up the corruption allegations brought against her by the former department head. City administration, which at the time included Garcia and Silva, suspended de los Rios following a complaint from a citizen activist who emailed a complaint alleging he was constructing the barbecue pit with city property and storing it in a city warehouse. City officials then investigated the allegations, suspended de los Rios for 30 days and demoted him to street maintenance supervisor. He did not show up to work following the suspension, according to court records. The case went nowhere since there was not enough evidence to prove de los Rios was demoted and suspended for using his right to free speech protected by the First Amendment to expose a corrupt agreement between the council members and Area Design & Construction LLC, a company owned by Marcelino Cantu. 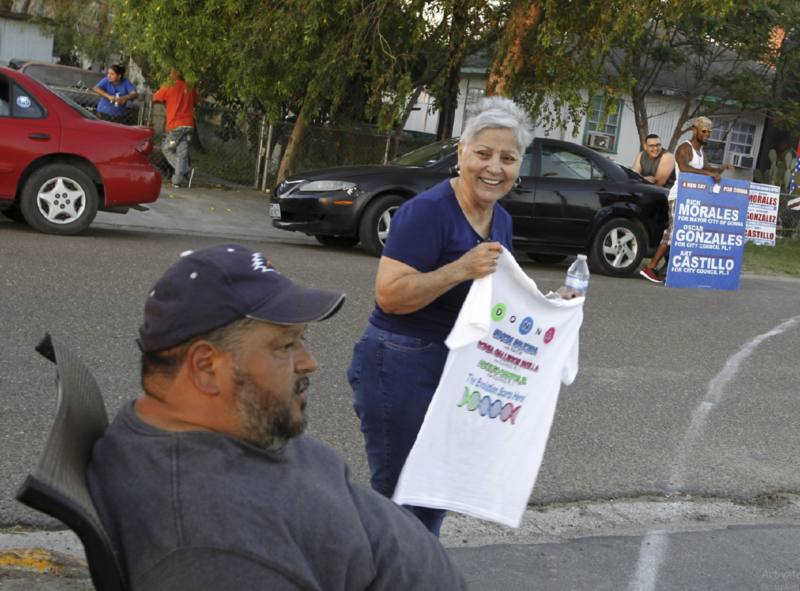 De los Rios claimed Area Design & Construction representative Abelardo Ybarra made a campaign contribution of “at least $110,000” to Sauceda, Gallegos, Alvarado and Simmons in exchange for a multimillion-dollar contract with the city. Cantu, though, “could not afford” to make such a campaign contribution or perform work on a multimillion-dollar project, according to a sworn affidavit he signed. He also disclosed that Ybarra did not represent the company. “I don’t know who that company was or who that gentleman was,” Gallegos said. De los Rios admitted during a deposition in April that he never witnessed money exchanged between anyone working for the company and councilmembers. “I never talked to Ybarra to see what he wanted or what was going to transpire between them,” de los Rios said during a deposition. Jared A. Clark of the Law Office of Francisco J. Rodriguez, the attorney representing de los Rios, could not immediately be reached for comment. “It is upsetting when you know that you’ve tried to do everything right for your city,” Gallegos said of the lawsuit. De los Rios, who often attends city council meetings and was involved in the most recent city campaigns, is not currently employed by the city. He sued for up to $2 million.